Story: You know how some dishes taste good only because someone specific made the dish - My cousin Shubha has a quite a few specialties - Idli saambar, Uttappa, Fajita Omlet, Masale Bhaat, Batata wada.... the list goes on! Me and Shank are both fans since grad school times.. that reminds me - it has been ages since we had Idli saambar at Shubhi's - I have to visit her sometime soon! 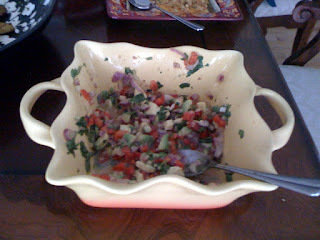 yeah - so about this salsa - Shubha made it for a BBQ party this summer - and we hogged on it big time! An interesting titbit: There is no tomatoe in this salsa! Oh.. and before I forget - I have to mention my BIL - Uday - I have promised him! I called for the recipe when Shubha wasn't around - So Uday read the recipe out of the book while looking after the kids... Thanks a ton Uday! Finely cut all the veggies, mix in a bowl with lemon juice, oil, salt and pepper. Enjoy with tortilla chips! This is simply a wonderful recipe. Every time I ate this salsa I found wanting more ! Its zesty and tangy. Ok. The Avacado I bought couple of days back is ripe. 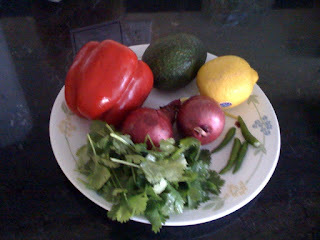 Time to try this salsa..
Salads are my passion and that is one of the most interesting dish to cook.